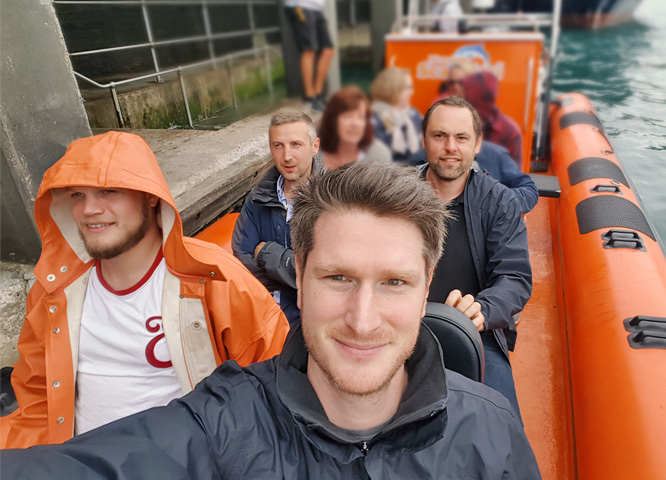 Last Friday our team outing saw the Drive crew hitting the high seas on a rip-roaring safari RIB-ride around the north Devon coastline. Seals, sea spray and smugglers’ coves along with some hair-raising, high-speed thrills, had the team wet and very windswept. Managing to pick the only day out of the studio that wasn’t a beautiful summer’s day, the clouds rolled in for some dramatic views as peregrine falcons tussled overhead and gannets that had been tracking a pod of porpoises dived-bombed the choppy seas for fish. The two and a half hour adventure concluded as we stumbled with our sea legs to the nearest watering hole for a pint of Lundy’s Gold.